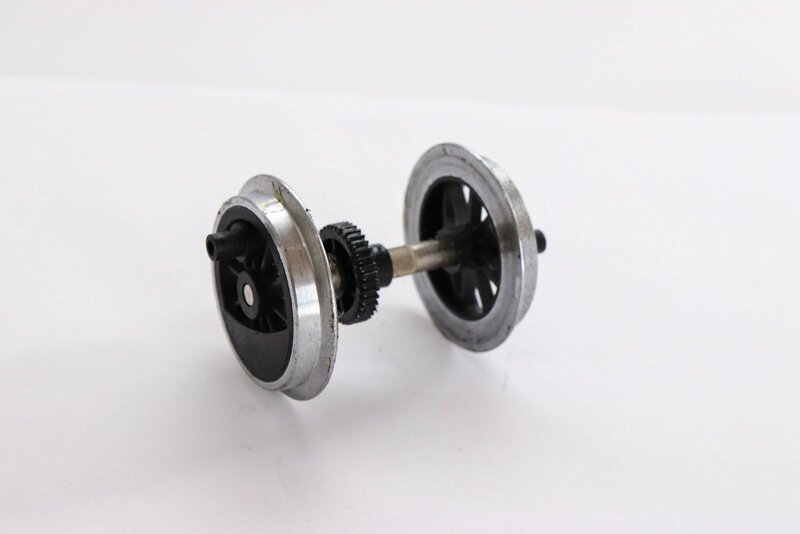 I have tried all the European and US online suppliers but cannot find anywhere that has replacement wheeled drive axles with the rubber tyres for LGB Uintah or Sumpter mallets. I have some replacement non-tyred axles but I like the tyres for the extra grip on my steep inclines. I have a Sumpter mallet that I have owned for a few years and it has tyred axles on both motor blocks and performs really well so I want to duplicate that on a couple of newly acquired mallet locos that do not have the axles with tyred wheels. Does anyone know if the new LGB mallets produced by Marklin have the same blocks with the same axle configuration and whether Marklin are doing spares? I don't know really, but is this helpfull? Another possibility is to lathe out a recess for the traction tire. The chrome plating is only useful on the plain tread surfaces anyway as filth does not stick to it easily. Those are for the older screw on axles with the two flats on each end. Is that what your mallets have? Ok then, As I suspected yours are the later push on type. The original link in your post shows the older screw on version. (If you look carefully you can see the double flat onside the hub of the wheel.) They also have the shorter stub for the connecting rods, less spokes and no curve to the balance weight. The same e-bayer is advertising the later type but with no traction tyres. Make sure you are ordering the ones you need. I stuck my oar in because I fell foul of a similar issue with those same wheels when I was looking to replace a worn out set. My solution was to use the old style axles I had in the spares box, they are the same diameter and length, but the splines for the cog are in a slightly different position. Have a look at warenburg2018 on ebay.de Mike. Thanks Paul I had looked closer and saw what you have recounted. I think that I may have used both ebay sellers in the distant past. Many thanks for the input lads.... hopefully I will have the locos up and running before winter ends..
Found it through lgb ersatzteille Mike, clicked on one of the many parts for sale that states warenburg-lutz then scrolled down quite a way and found shop: warenburg2018. Loads of axles on there looking just right. I think most LGB use the same wheel sets with only the colour and number of spokes varying from loco to loco so you will probably not find them that hard to locate. Only the US Moguls have larger wheels and the Porter and feldbahn locos smaller wheels. If they use the standard Buhler motor they will have the same gear on. I think the Corpet Louvet may use the same wheel sets. It is the gearing and size of the rod connectors that is important. The US mallets 20892, 21982, 22982 20882, 21882 and the german mallet 22582, 23851, 24852, 25851, 26851 had the same motor blocks (but different axles for the traction tyres) also , of course the german mallets mainly have red wheels.